The book The God Chasers[TGC] was published in February 1999 by Destiny Image of Shippensburg, Pennsylvania.1 The author is Tommy Tenney, an annual speaker at Dave Markee’s church, Follys End, in Croydon, southern England. Tenney has raised a number of issues as a serious challenge to the Church of today, many of which are valid. The radical solution to the Church’s malaise which he proposes is examined in this survey. The issues Tenney raises are rightly disturbing to those who are willing to think seriously about the real state of today’s Church, particularly in the USA and UK. One problem area in the Evangelical Church concerns our attitude to the Bible, which is the written Word of God. In our experience-oriented culture, there is always the danger of people seeking spiritual experiences almost apart from the Bible and then pulling out Biblical texts to try to justify their experiences. There is a lack of testing things by the Word; people prefer to judge by other criteria, such as their reason, or their gut feelings, or whether it is in line with the way they perceive the purposes of God in what they see as the Endtime generation. For this reason some people, particularly those frightened of fanaticism, treat the written text as if it has nothing to contribute to our daily life in God apart from the bare written text. This Word-only approach to the Christian life seems to provide an answer for the timebeing, but, in the longterm, Christians who want to know God intimately find it barren and frustrating. In this way, pressure builds up within and some believers, once thought to be so “sound”, suddenly “break out” and join strange Christian groups or give their support to strange emphases within Church circles. Our meditation on the text of God’s Word should always be combined with a positive seeking of God in the Word. It is not enough just to read the Bible each day. Our reading should be combined with a spiritual intensity which seeks God’s presence and voice in His written Word. Of course, the devil can try to apply the Word to us to bring under his control, so we always need to test everything that comes to us with power by praying, “Lord, if this is of You, I accept it. But if it is from the devil, I reject it in Jesus’ name”. It should not be forgotten that devil quoted the Bible to Jesus Himself and he replied by wielding the Word. God the Father empowered Him to use a particular part of the Bible to oppose the satanic lie. Another issue is the presence of God in our Christian gatherings. Often Christians do assume that God is present in their gatherings simply because of Jesus’ words that He would be among us. But what is overlooked is that He said, “in My name”. Christians holding a meeting is not the same thing as gathering in His name. When we gather, it should be with the awareness that we are, on that occasion, gathering in or with His authority. Then we should ensure that we come with a right attitude: not just to meet with eachother, but to meet with Him. This means that we are expecting Him to be present in way He would not be present if we are meeting with unbelievers. There should be different feeling to the meeting, a sense or awareness of His presence. But this sense of His presence should resonate with what we know of God already in our spirits, if we have been truly born again and the Spirit of God lives in us. This has nothing to do with shakings or jerks or other bizarre phenomena. Then again, to what extent should we expect God to “redefine the Church”? Naturally, it all depends what is meant. Certainly if it means that we should reconsider the way we do things and not just keep up traditions as if they have acquired some intrinsic sanctity by virtue of having been done that way for generations, then it is true that rediscovering the Biblical definition of the Church is necessary. The Lord should be the One who directs us in all we do. Furthermore, it is understandable that He may not wish us to continue forever in some of our traditions. However, this does not justify the attempt to impose manmade structures on to the Church ‘in the name of God’. Much of what is touted today as “redefining the Church” is merely a sales-pitch for the agenda of a group of people who want to be accepted as “apostles” and “prophets” by the Church as a whole. The agenda of pastors signing cross-denominational covenants, and submitting to the control of super-apostles has to be promoted by threatening people that, if they do not go along with it, they may miss what God is doing today. Whereas there are good Biblical grounds for decisively rejecting the claims of these men who claim today to be “apostles” and “prophets”. The whole issue of reconsidering the way we “are church” or “do church” is important, but it is something that should be examined independently by each local congregation before the Lord. Another key issue raised is that of brokenness before God. Our obligation to walk the way of the cross is a teaching which is largely lacking in modern Evangelical and Charismatic circles. However, it is a fact that the cross is God’s remedy for self-righteousness, and even for self-consciousness, self-will and self-determination. Everything we are and have must be placed on the altar before God for Him to resurrect as He chooses. Our real enemy is sin and those legitimate aspects of us tainted by sin need cleansing, not destruction. Our understanding of what needs to be dealt with in our lives is usually distorted, which is why there can confusion and why teaching on the cross must be applied by the Holy Spirit and not enforced by the will of our human mentors. Warped teaching in this area can be highly destructiveg to our spiritual lives. It is as if a surgeon in the course of his operation removed some healthy organs from our physical bodies. There is no teaching in the Bible, rightly-understood, which encourages us to desire the destruction or setting aside of natural aspects of ourselves in order to penetrate the spirit-world. Tenney raises all these issues for debate, and rightly so. However, the real question before us is whether Tenney’s verdict on these issues really is God’s verdict on these issues. Accordingly, his proposed solutions will now be examined. Oneness Pentecostals sometimes call themselves “Apostolic” to distinguish themselves from trinitarian Pentecostals. Other problems with Oneness Pentecostalism are legalism, elitism, and judgmentalism towards orthodox Christians. Oneness groups tend to regard people who have not been immersed “in Jesus’ name” as unsaved and the UPC itself goes as far as to insist that people who have been immersed in the name of the Father, Son and Holy Spirit must be reimmersed “in the name of Jesus”, because otherwise they will remain unsaved. This encourages UPC members to think that their admittance into heaven is decided by their own performance rather than by simple faith in Christ’s atonement. Oneness Pentecostals, including the UPC, insist that the reception of the Holy Spirit must be accompanied by speaking in tongues. As a result, many of them maintain that Christians who do not speak in tongues are not even saved. Hardline Oneness adherents believe that they are into higher truth because of their superior doctrine and strict holiness standards. The UPC official holiness code presents to its members a long list of ‘dos-and-don’ts’. They are urged not to watch television or go to cinemas, or sports events. Women are instructed not to wear makeup, jewellery, trousers, or short hairstyles. Indeed, members of hardline UPC churches are taught that Christians who are not UPC members are hellbound because they watch television or wear jewellery. Either Tenney himself still holds to the Oneness error or else, unlike orthodox Christians, he considers it an issue of only secondary importance. There is clearly a problem with manifestations of this kind. This can be seen by comparison with miraculous healings. When someone is healed miraculously, anyone, Christian or not, can connect it to the grace of God. A healing genuinely from God clearly reflects His kindness and concern for suffering humanity. In this way, the miracle has a message. It is the same with any true miracle of deliverance. All of them reflect the grace of God in a comprehensible way. This is always true of such works of God, whether miraculous or otherwise. However, sometimes God administers punishment to people in this life in judgment against their sin. This is actually more common than is generally acknowledged in modern Christian circles. In some cases, this is done in a miraculous way to produce maximum shock and fear in the observers. In the Book of Acts, there are clear examples of this. One case involved Ananias and Sapphira who sold a field and gave a portion of the proceeds to the apostles for distribution among poor believers. Their sin was that they pretended that the sum they were presenting was actually the full amount which they had received for the sale of the land. The Holy Spirit showed Peter what was going on and he rebuked both husband and wife for lying to the Holy Spirit. They died on the spot (Acts 5:1-11). Another case is that of Herod giving a speech, when his audience said that they had heard the voice of God and not a man. Because Herod failed to give the glory to God at that point, he was instantly eaten by worms and he died on the spot (Acts 12:20-23). Tenney often refers to Uzzah who tried to steady the ark of God while it was being transported on an oxcart to Jerusalem. As soon as Uzzah touched the ark, God struck him so that he died on the spot (2 Samuel 6:6-7). There are many other Biblical examples. However, the message of all these interventions is very clear: God was displeased with some thing the people involved did and acted in judgment against them. They all carry their own message and no one is any doubt as to their meaning and purpose. But what is to be made of this strange phenomenon: the splitting of a pulpit? I would like to suggest that any unbiased reader told of the incident and without reading the spin put on it in The God Chasers would come up with only two options. If this is from God, it certainly looks like judgment. People would normally ask whether the pastor had displeased God in some way and whether God was about to cast off that church. However, the message of this incident in not so clearcut. Why is this? First, the pastor was unharmed, being perfectly well afterwards. If God had been judging him of some sin, it would have to be really serious to warrant such a dramatic judgment and it is likely that he would have died on the spot, just as in the examples we have seen already. Furthermore, there is no evidence that that the pastor had been involved in serious sin of the kind which would warrant a public judgment of so dramatic a nature. Then again the pastor himself claimed that a number of apparently beneficial miraculous events occurred on the days following this strange phenomenon. And perhaps most importantly, there was no prophetic warning of coming judgment or prophetic explanation in terms of judgment immediately after the event to warn other people that if they engage in similar sins, they would be likewise wiped out. So, although to any normal observer, the scenario looked like an outpouring of God’s judgment, there are anomalies which seem to contradict this possibility. The second possibility is a poltergeist-type phenomenon. “Poltergeist” is the German for a “noisy” or “boisterous” spirit or “ghost”. It is the term used to denote spirits, or demons, which enter homes or other buildings to cause observable chaos. While the spirits remain invisible, they cause visible phenomena, such as objects floating around in the air and push objects off shelves to the ground. Although these phenomena are frightening, people are seldom hurt and objects seldom damaged. However, permanent damage does sometimes occur. If the phenomena at Houston were not an action of God’s judgment (which they clearly were not), then it would seem that it must have been the activity of deceiving spirits. There is no denying that a hallmark of many churches in the USA is tight human control. Americans are very good at organizing and this can easily dominate church-life. So when an unusually strong spiritual presence took over, it seemed obvious to Tenney that God was, as it were, ‘repossessing’ the church as if He had disowned it before. But this conjunction of human control and wild phenomena does not prove the truth of Tenney’s interpretation. In reality, Tenney’s attempted explanation is confused and highlights a general tendency throughout The God Chasers to attribute to God phenomena which actually have the marks of some source other than Himself. Indeed, what Tenney actually does is to take as normative phenomena which he had encountered either in the course of his Oneness Pentecostal background or in some other meetings he attended since, and then attribute these to God. In one case, he actually superimposed a phenomenon on to his reading of Scripture. 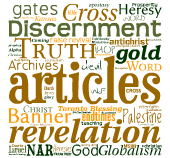 He stated that “Moses kept the veil over his face after the shine of ‘glory dust’ faded.”[TGC20] In fact nowhere does the Bible ever speak of “glory dust”, although this is a phenomenon which certain more extreme Pentecostal groups claim from time to time. The Bible just says that the skin of Moses face shone. It would seem that Moses’ skin became charged with the glory of God and functioned as a kind reflector for the glory. But there is no evidence that any shining physical-type substance was attached to the surface of his skin. The use of the phrase “glory dust”, although seemingly no more than a detail in Tenney’s book, is actually very revealing and serves to illustrate a thread running through his entire approach to spiritual phenomena. Apparently, on that day (June 4, 1951), Alexander, a Polish teenager attending the Bible Institute in City Bell, a small town near Buenos Aires, had felt the heavens with its stars to be pressing down on him causing him to cry out. The stars seemed to change into great orbs of fire, becoming ever brighter. The next morning, the “Visitor manifested Himself and stood by the side of Alexander. He could not be seen in human form, but manifested Himself so markedly that we all knew that He had come. In spirit He was seen by Alexander who talked to Him.”19 The “Angel” then began to speak in a language unknown to Alexander, who repeated all the words. Although the sample of the writing provided would certainly seem to indicate that the writings came from a spiritual source, they do resemble spiritistic productions more than anything originating from the Holy Spirit. 23 The following thoughts on Dr Miller and the Peniel Revival teaching by Char Stucki who was strongly influenced by him at a crucial stage in her spiritual life will be of interest. My husband and I met Ed Miller in 1963 at the Peniel Bible Institute in Mar del Plata. We lived in Argentina for the next three years and worked in affiliation with the Argentine Bible Assemblies, which he founded. The last year, we lived at the Institute and were in close contact on a daily basis with him, sitting under his teaching in day time classes and nightly meetings. I have to acknowledge that I was personally “bowled over” and “awed” by the mystique of this man. I venerated him deeply as a person of intimate acquaintance with God. I believed that he had “penetrated” into a place in God far beyond the average run of the mill Christian, and having a very mystical bent myself, I wanted to discover the secrets of the Kingdom that he seemed to have discovered. I would often weep when he spoke about God, and then be alternately frustrated because his “gnosis” seemed to be so far beyond mine and so out-of-reach. It took many years to unravel the knot that the Peniel teaching that was perpetrated by Bro. Miller and his sons produced within me. The name of their ministry, Peniel, perhaps best summarizes the focus of their teaching. Peniel was the place where Jacob, alone, wrestled with the angel of God and his thigh was finally disjointed and he declared, “I have seen God face to face and my soul is delivered.” Brother Miller himself claimed to have had such an “experience of God” years before in Mendoza, which he wrote about in his book, Thy God Reigneth, now published as The Flaming Flame. After an intense period of seeking God in prayer and fasting, God revealed Himself to him, and he heard things that were “unspeakable to utter”. Things that he said that he could never tell anyone, not even his wife. Secrets, hidden things, mysteries of God that could not be shared. Looking back on those years when my young, yearning heart longed to also be one of the “enlightened ones”, I realize that this was nothing less than mysticism, a christianized version of gnosticism, in which there are those with a higher knowledge of spiritual things, people who have met the conditions, have pressed through into deeper spiritual realms and acquired an understanding that only comes to those who “strive to enter” and “battle through all of the opposition” into that heavenly dimension where God manifests and reveals himself. Besides this mystical knowledge of God that he possessed, and which others who were willing to belong to God’s inner circle could also possess, there was a strong emphasis on “holiness unto the Lord”. The church which Edward Miller founded in Atlanta, Georgia bears that writing on its pulpit. Brother Miller believed and taught that a Peniel-type encounter with God would also produce holiness of life and that a believer who had seen God face to face would manifest godliness of life and be a person of prayer, devotion, service, worship, separation from the world, etc. He believed that a genuine revival would bring believers into that kind of a life-style. He was passionate about urging people to “experience the manifest Presence of God” where they would have a face to face meeting with God that would result in a changed life. Who could argue with a goal like that, especially when as a minister, one is surrounded by people who often seem indifferent to God, or who struggle with sins in the flesh, or who manifest other carnal behaviors and attitudes? This teaching was carried to its extreme, but probably logical, conclusion several years ago in Atlanta when Brother Miller was still pastoring there. I am hesitant to write about it, because I was not personally present, and only have the stories of a number of very disillusioned people who were there. The church experienced a ‘move of God’ which originally began in Holland. What characterized this ‘revival’ was that people began to have terrifying experiences of hell and judgment and their lostness. These were people, many of whom had been believers for many years. I am told that they would literally at times, feel the flames of hell, feel themselves hanging over a pit ready to fall in, would “see” scenes of the Crucifixion, would feel their guilt for having killed the Son of God. They would lie prostrate and scream and wail and weep, sometimes for hours, in agony. And then, for the fortunate ones, relief would come and they believed that they had been truly “converted” or “born again”. This became the standard for an authentic conversion, and those who did not pass through an experience of this nature believed that God had by-passed them and that they were not really saved. I have personally talked to at least eight people who were not among those who had this experience, and one who did, and they are all totally disillusioned and have been unable to recover from the damage that this wreaked upon their faith. The Gospel makes our starting point what religious zeal makes the destination. The believer who does not understand the Gospel of God’s grace is constantly striving to ‘arrive’ at some higher level of spirituality. Always trying to find a way to fix his sinful flesh. To become more devoted or godly. The Gospel justifies the ungodly and sanctifies the sinner and makes him “in Christ” as righteous and holy as he will ever be, because his righteousness is not in his flesh, but in the Man Christ Jesus. The Gospel freely gives a man who believes a perfect standing in the presence of God. And now, because we are justified, we are sanctified, we are cleansed, we are free, we can walk in love and the righteousness of the law is fulfilled in us by the Spirit of Life in Christ Jesus. It is a life of rest and peace, not constant striving to “become.” It is a life of quiet “abiding in Christ”, not trying to get “into Christ”. It is significant that Tenney commends both this Argentinian ‘revival’ and the Hebrides Awakening of 1949-1953. The Hebrides work was clearly a work of the Holy Spirit and, despite the extraordinary phenomena accompanying it, few orthodox Evangelicals would have any difficulty accepting it as a work of God. Nothing in it contradicted the Bible or what might be termed ‘received Evangelical wisdom’! This is quite different from the sheer alienness of the Argentinian ‘revival’ which requires a fundamental paradigm-shift among orthodox Christians before they would be able to accept it. However, this seems to be no problem for Tenney in his present phase as he lumps the true and the false together without hesitation. Someone whose discernment is as confused as this is simply not qualified to deliver a trustworthy interpretation of spiritual phenomena which he encounters. It is worth noting also that many of these churches in which unprecedented phenomena of this kind occur are those which have already embraced the kind of spirituality associated with the contemporary “River Revival”. Failure in discernment is not necessarily a reflection on a person’s character. He may be a true Christian brother. He may be the most gracious, humble Believer in the history of the Church, but if his discernment is confused by exposure to wrong teaching and acceptance of deceiving spirits, he cannot be trusted in this matter. In this area, uncomfortable facts must be faced. Only then can we help our confused brothers and sisters. In the case of Tenney, he was brought up in a Pentecostal tradition which is clearly flawed in many areas, enshrining both first-rank error and failure in discerning the source of spiritual phenomena. UPC churches are noted for the great exuberance of their services and for working up emotions. They believe that all members should “speak in tongues”. In Biblical teaching, “the gift of languages” is something which God gives to people in His sovereignty as and when it is needed. It is not something which people can imitate and use whenever they choose. Therefore, in any denomination, sect or cult, which encourages every member to “get the gift” in order to attain a particular level of spirituality or a particular anointing for ministry, it is clear that the majority will find themselves experiencing a manifestation which does not originate with the Holy Spirit. He further suggests that the seeker should “deliberately … move away from our own language” and “go backward to the babblings of a baby”.28 Pugh admits that such babblings may not initially be Spirit-inspired, but if the seeker “continues in the state of spiritual suspension and yielding” to the place when he comes to “a psychic zero,” he will be filled with the Spirit.29 According to Pugh, this “cannot fail”.30 So much for the Lordship of the Holy Spirit in the life of the Believer! Yet even in trinitarian circles, where people would be expected to know better, most “tongues” are a psychological phenomenon which anyone, even a nonChristian, can learn to do, provided he or she becomes sufficiently disinhibited. There are also demonic counterfeits of “tongues” or “languages”, which occur less often. It is a sad fact that some demonic counterfeits are actually authentic languages, whereas most Pentecostal “tongues” are no more than gibberish. A person brought up in the Oneness tradition, which is blatant and utterly unapologetic about such psychological manipulation, yet still calling both his forbears and himself “Spirit-filled”, clearly accepts all such manifestations as true products of the Holy Spirit. But unless such a person repents of all counterfeits which he has experienced or accepted, he will remain undiscerning in such matters. His discernment will always be compromised until he stands in clear judgment against past false experiences. This article is copyrighted to Mr Mike Taylor. He has requested that NO reproductions be permitted; therefore applications for use elsewhere will be refused. If you want people to read this article from your own site, please provide a link (only) to the first part of the series.